I know it’s hard to believe, but we are officially back in session. The summer was short, but packed with progress. This brief post will outline the work we’ve done this summer, and will highlight the plans moving forward at Tri-Valley! To start, we again grew in enrollment as a district over the summer. Obviously, a concern throughout Bloomington/Normal was the impact that State Farm may have on our overall student population. As of the third day of school, our enrollment is up slightly. When we look at our growth over the past several years, it becomes clear that Tri-Valley has become a destination district for families. We receive calls daily inquiring about moving into our district or residency requirements. Tri-Valley has great teachers, great kids, and great families. It’s exciting to know that others continue to want to join us. This summer we also launched a new website and our official Tri-Valley app for smartphones. These new resources will allow us to communicate quickly, and hopefully will create an ability for everyone to stay connected via the app. This new and improved method of communication and sharing of information is something we are very proud of. From a curriculum and instruction perspective, a great deal of work has begun in relation to how we address standards and report student progress. We hold a “viking academy” each summer for our staff, and this year the focus was on best practices in assessment and identifying standards. We will be working hard to analyze data as teams to improve the experience for our students. This is extremely exciting work, and we are thrilled to share our progress over the coming months. 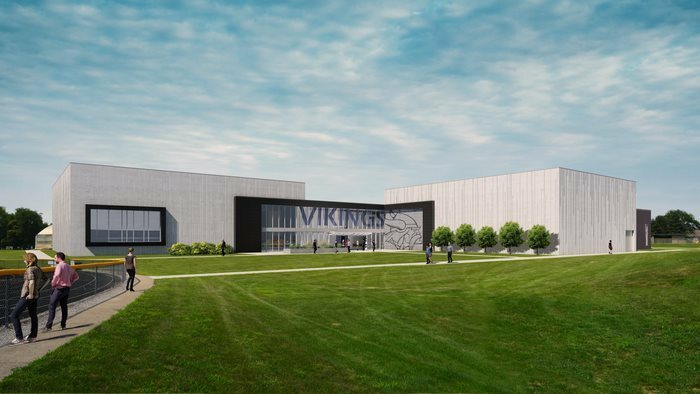 This summer the “Viking Vision” plan has been a major area of focus. Construction has been completed on a new parking lot, new sewer system, new drainage, improved industrial arts space, an updated art room, an updated agriculture classroom, and an incredible fitness center. I have to be honest, I get so excited seeing the new spaces! I can’t wait to invite everyone in to take a look at just a few of the phase I updates. Phase II planning has already begun, and I will kick out updated information as plans solidify. Phase II will include the construction of a beautiful auditorium, a band and chorus commons, an event entry, an auxiliary gym, and updated classrooms throughout much of the academic area of the high school. Next summer will be CRAZY!!! Again, more information will be released as it comes available. For information, you can always visit my superintendent website at www.tv3unit.com. I’ll try to keep everyone updated on progress, plan changes, and any other information related to the Viking Vision. Lastly, I just encourage everyone to get involved, be supportive, and share the good news related to Tri-Valley schools. When I met with staff on opening day, we discussed our philosophies toward working together, with students, and with families. We discussed the importance of establishing relationships. focusing on the child in front of us, celebrating our successes, sharing areas of growth, creating a culture to be proud of, and our ability to make an impact on the lives of others. Finally, we discussed that our Tri-Valley community is a FAMILY! On a deeply personal note, this summer was very difficult and allowed me to see our community from a unique perspective. On June 29th, I lost my Father, and admittedly have been overcome with grief. I experienced the power of the Tri-Valley FAMILY first hand. The outpouring of support from this community toward our family has been overwhelming and humbling. I realize how lucky I am to serve in a district that is blanketed in support and love. I hope you feel the same as you entrust us with the education and care of your children. We take this responsibility very seriously. Let’s make it a great year! Go Vikings!!! !